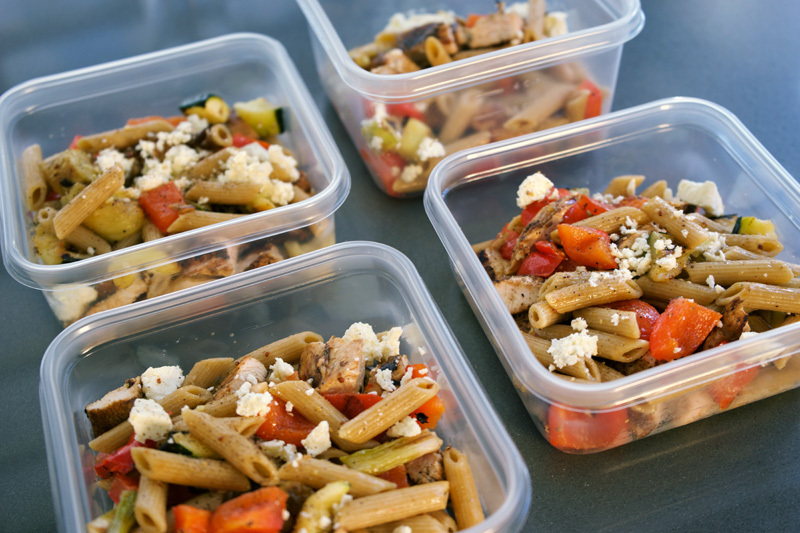 Roasted vegetables, balsamic chicken and penne make for a great pasta salad you can enjoy hot or cold. A favorite I make often over the summer, it makes four generous lunch servings that taste great cold the next day. Or, if you’re looking for a quick weeknight dinner, grill and enjoy immediately. 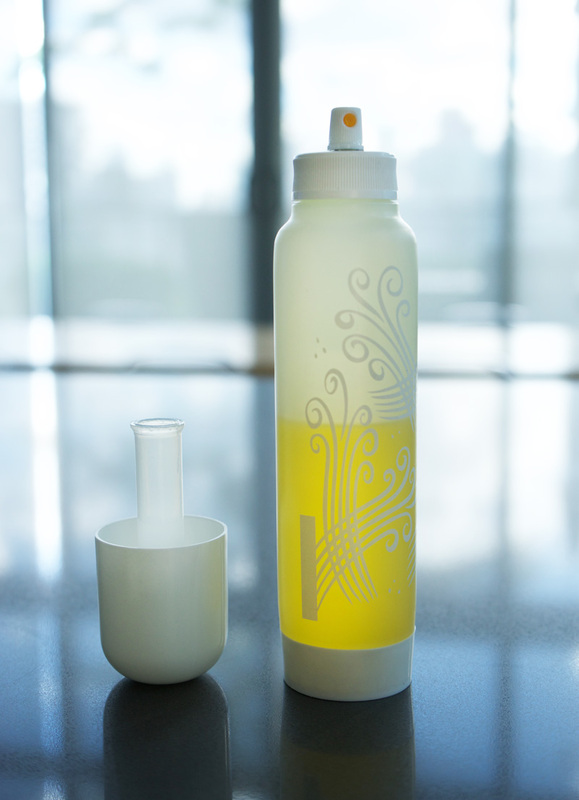 A big timesaver when it comes to grilling is using an olive oil spray bottle—I prefer to buy the bottle and fill it with my own olive oil so I know exactly what’s in there. I fill it up with just a regular olive oil (saving the extra-virgin for drizzling or making dressings where you can savour the difference). The bottle I have has a pump in the lid so you can remove the air, allowing it to spray into a fine mist perfect for lightly coating the vegetables in this recipe. I used to toss this pasta salad with a pesto, and that works out ok, but I’ve come to prefer this grainy mustard dressing. It coats the pasta and lightly dresses the vegetables without overpowering the dish. I have a love-hate relationship with roasted red peppers. It took me years to figure out how to roast them to get the skins off. Unless you really, really blacken the skins like the pepper lid top right, it’s pretty tough to remove the skins. So, depending on my mood (and whether I forgot about the peppers and left them on the grill too long! ), I either just under-roast the peppers a bit and leave the skins on (remove them before they get papery), or really blister them for deeper roasted peppers where the skins come off. 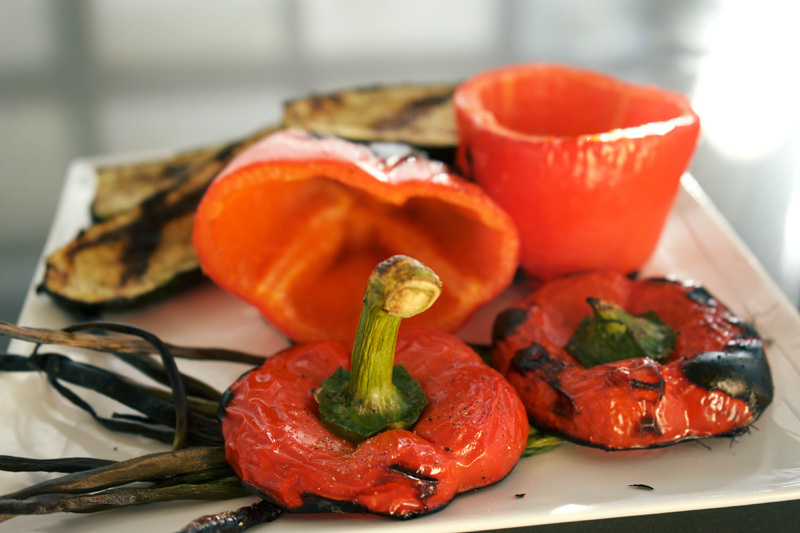 Or sort of go half-and-half, like the peppers shown above, removing the blackened bits that come off easily. Marinating the chicken briefly in balsamic vinegar and olive oil gives a great flavour and depth of colour when grilled. I separate the tenders and slice the chicken breasts to flatten them, so that the thickness is more even. that way they cook through quickly and won’t dry out. You’ll want to pull the tenders off earlier as they will cook more quickly than the larger pieces. The final plated pasta topped with fresh ground pepper and some crumbled feta. You can always mix it up with this recipe: try it with mushrooms, goat cheese, asparagus or toss in some spinach while the pasta is hot to wilt it. Lunch feasts packed up and ready to go. A great and healthy way to fuel your week at work. 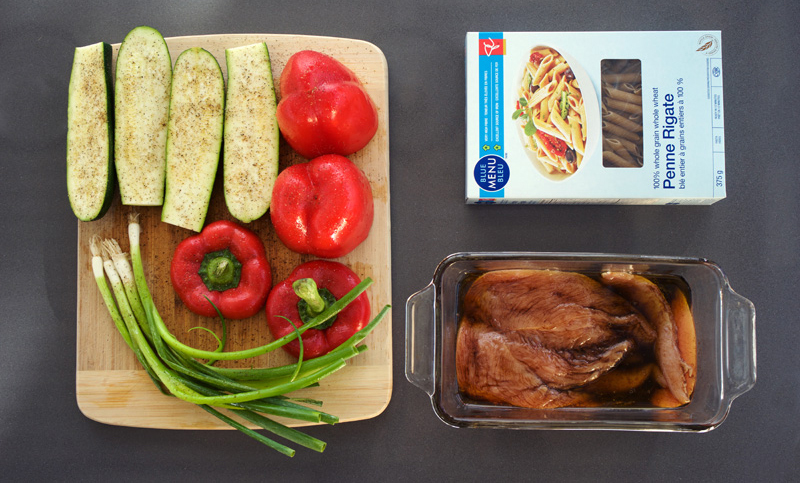 Pasta, peppers, zucchini and mustard dressing come together for a quick and healthy meal. Combine olive oil and balsamic vinegar in a dish large enough for the chicken. Prep chicken breasts: remove the tenders, and slice into the thickest part of the breast, opening it up like a book. Set chicken breasts and tenders into the prepared dish and marinate for 15–30 minutes. Heat grill to 400°. Prep vegetables: spray lightly with olive oil and season with salt and freshly ground pepper to taste. 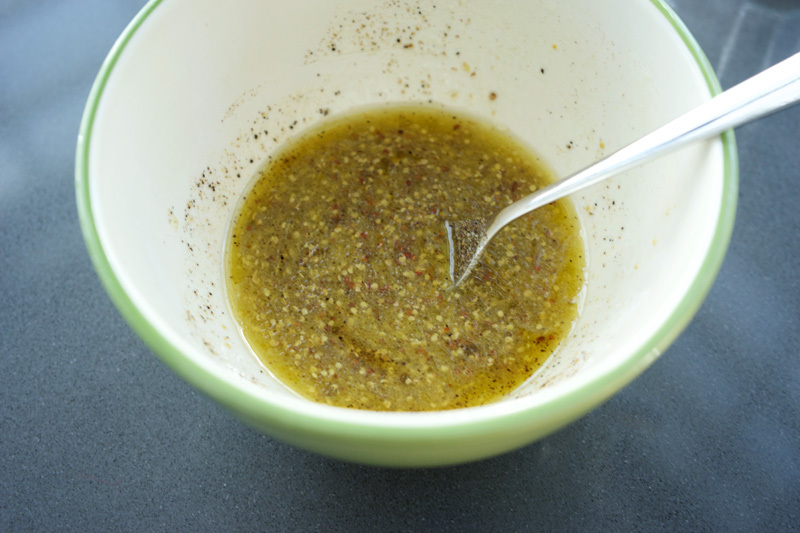 In a small bowl, combine the grainy mustard dressing ingredients. Cook penne according to directions, drain and place into your final serving bowl. Add a few tbsp of the dressing to keep it from sticking while you prep the remaining ingredients. 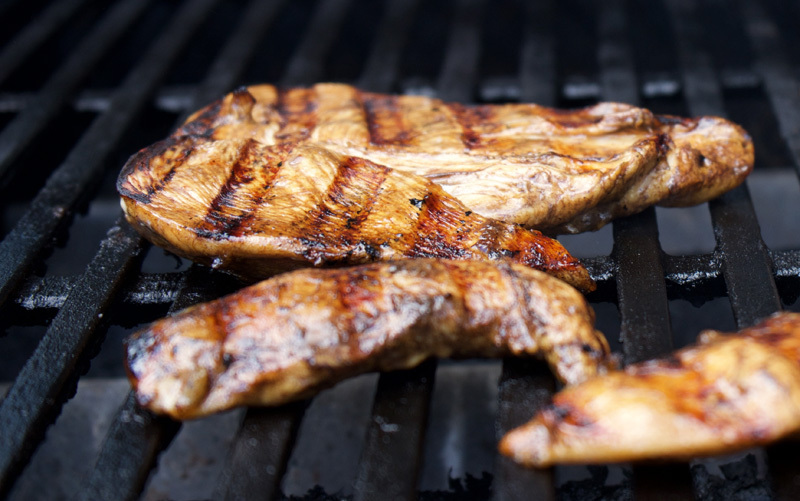 Lightly oil the grill; place the balsamic chicken breasts and tenders onto the hot grill. After 2 minutes, reduce heat to 350°. The tenders will cook more quickly, check them after about 8 minutes and remove when cooked through. Continue cooking the breasts an additional 5–6 minutes until cooked. Remove to a cutting board and chop, adding to the pasta bowl. Add remaining dressing to the pasta bowl, season with additional salt and freshly ground pepper to taste if needed. 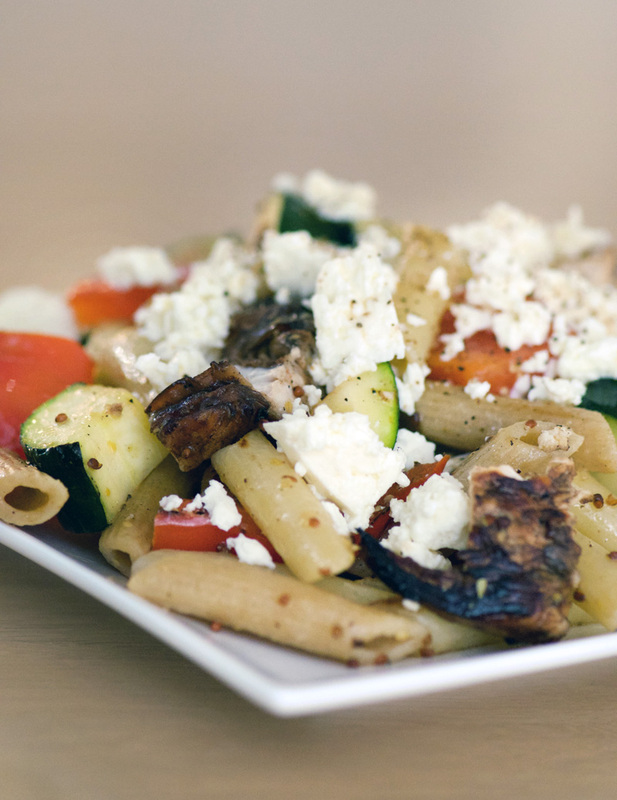 Divide among serving plates, and top with crumbled feta.